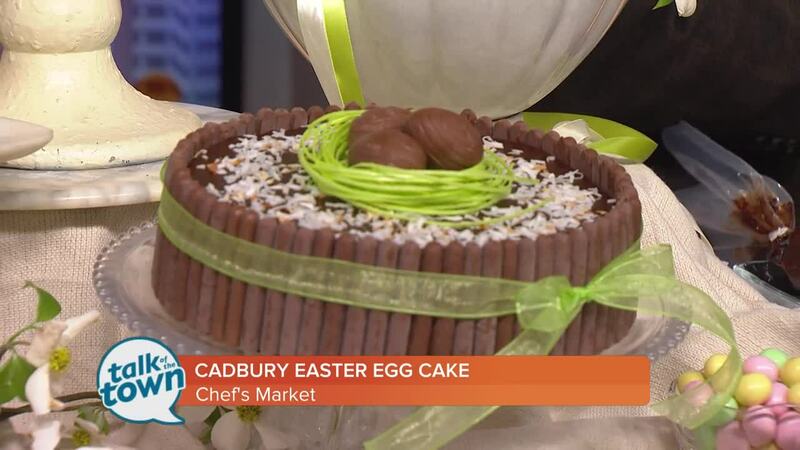 Jim Hagy from Chef's Market made a Cadbury Easter Egg Cake. (see recipe below) Chef's Market Catering & Restaurant is located at 900 Conference Dr., Goodlettsville, TN 37072. For more information or menu details visit www.chefsmarket.com or call (615) 851-2433. Look for Chef’s Market on Facebook and @chefs_market on Twitter and Instagram. Not only is this cake a whimsical addition to your Easter after church dinner, but it is so delicious. When you cut into it, it looks like you are cutting into a Cadbury egg. Begin by using any chocolate cake recipe you want for the cake rounds, whatever is your family favorite. The secret to this recipe is the two great tasting frosting recipes. Use the chocolate butter cream frosting below to frost your cake with a thick layer on the sides. I use the icing because it holds the cookies to the perimeter. (more below). The ermine butter cream is perfect for the Cadbury egg center as it is light and fluffy. Dye half the ermine icing to the color of an egg yolk with the yellow food dye. To the thick outer layer of chocolate icing you stick on the crunchy and delicious Cadbury Finger Cookie. Finish by tying with a pastel ribbon and garnishing with candy Easter eggs. The end result is a cake that is fun and arguably tastier than a Cadbury Egg. Begin by making both of the icing recipes below. Separate the Ermine icing in half. Add yellow and red food coloring to half the Ermine icing until it looks the color of an egg yolk. Place in pastry bag. Place the white half in a pastry bag as well. Place one cup of the chocolate buttercream into a pastry bag. Beginning on the outer edge of the round, pipe three inches of chocolate buttercream. Moving into the circle next to the chocolate icing, pipe the white butter cream into 3-inch-wide circle. Finally pipe the yellow buttercream into the center. Looking down on the cake it should look like a large cracked egg. Use an offset cake spatula to smooth. Add the top layer, then ice the outside of the cake with remaining chocolate butter cream. Vertically adhere Cadbury Cookies to the outer edge of the cake by pressing the flat edge into the icing circling the entire cake. Tie with a ribbon. Optional: garnish with a bird’s nest of toasted coconut and blue candied eggs. Put the finely chopped chocolate, vanilla extract and salt in a bowl. Heat the cream on the stove until bubbles just start to form around the edges. Pour over the chocolate. Cover with kitchen towel and leave to sit for 5 minutes. Whisk until melted and smooth. Set aside. Melt the 4 ounces dark chocolate and set aside. Put the butter in the bowl of your stand mixer, fitted with the whisk attachment. Turn on high speed and whip for 8-10 minutes, until butter has turned almost white. Add the confectioners/icing sugar, cocoa powder and cream, and turn on low speed for 30 seconds. Turn up to medium and whip until combined. Add the ganache, melted chocolate, vanilla extract and coffee. Whip on high speed until fluffy, about 3-5 minutes. Place sugar, flour and salt in the small sauce pan and whisk together. Stir in the milk. Cook over medium heat, stirring constantly until mixture comes to a boil. Continue to cook a very short time, stirring, until very thick. Remove from heat and pour into a medium mixing bowl. Cool to room temperature. When cool, whisk in a stand mixer, using whisk attachments and beaters if using a hand held. Add butter a tablespoon at a time until smooth (butter should bend and not break at room temperature). Add vanilla and beat in. Remove half the recipe then slowly add drops of yellow and red food coloring slowly until you have an egg yolk tint.